Datamaran – the leading platform that analyzes ESG disclosure using qualitative and quantitative data – releases a brief on the TCFD signatories’ disclosure of climate change risks. 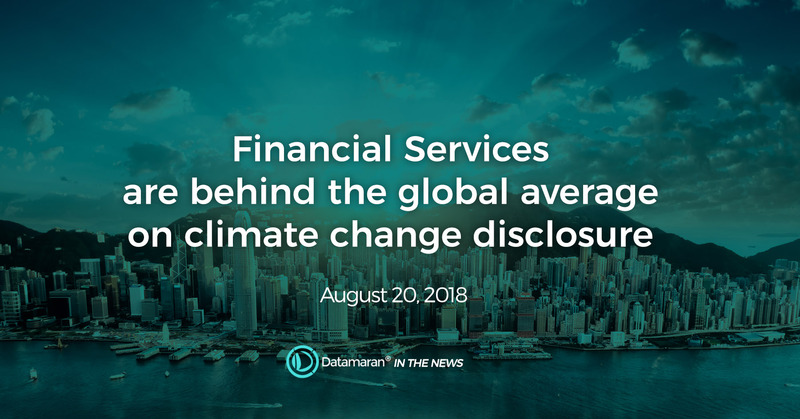 LONDON - Financial Services are lagging behind all other industries when it comes to climate change disclosure according to a new data brief released by Datamaran. Datamaran is the global leader in Software as a Service (SaaS) solutions for non-financial risk management. Primarily dominated by financial services, there are over 200 of The Task Force on Climate-Related Financial Disclosure (TCFD) signatories across all sectors, which account for $44 billion in average market capitalization per company. Coupled with the fact that financial services are one of the biggest sectors in terms of market capitalization, approximately $17 trillion, their potential impact on climate change can be far reaching. Further findings include that non-financial services started to put more emphasis on climate change in their reports a year before the TCFD recommendations were released, going from 31% in 2014 to 43% in 2015. It was only the year after the TCFD recommendations were introduced that an increase was observed among financial services signatories reporting on the topic of climate change. Interestingly, in 2018, financial services saw a 10% drop in high emphasis reporting on greenhouse gases but saw a 14% rise in climate change disclosure. Three years after the TCFD recommendations were released, financial services reduced the gap in climate change reporting, going from 31% difference in 2016 to 15% in 2018.